Fuel Gas Conditioning Systems remove small amounts of moisture, liquid mist, and particulate contaminants from fuel gases. 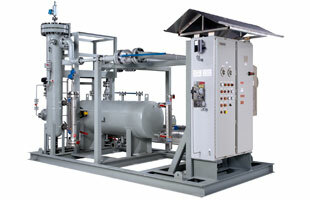 Capabilities include gas preheating and pressure reduction as required by specification. Gas metering is also available. The FGCS prepares the fuel (natural) gas for use in gas turbines, gas furnaces, gas burners, etc. It is typically used by gas turbine manufacturers, combined cycle power plants, natural gas turbine installations, gas fired furnaces, and small off-shore and on-shore power generators. A variety of Fuel Gas Conditioning System configurations are available to match the specific needs of different applications.